Download this Civil War Worksheet for free! What’s up fellow history teachers. I’m teaching the civil war this week. I thought I’d share some of my favorite Civil War worksheets and Civil War activities. At the end I’ll also tell you how you can get a copy of my civil war test. I love the civil war, it’s one of my favorite subject to teach. I can still remember sitting in class in 8th grade and learning about the civil war. We watched every video of Ken Burns Civil War documentary from PBS. It was awesome. Every time I teach this lesson I’m taken back to my history class. Definitely one of my US History lesson plans to teach! Here is a great Civil War worksheet that you can use as a bellringer / opening activity. 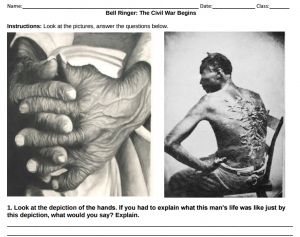 This worksheet helps students consider the cruelty of slavery and its impact on the start of the Civil War. This worksheet is a a part of our “Civil War Begins” lesson plan. One of my favorite activities for the Civil War is to set up a mock Lincoln-Douglas debate. It’s simple to do. Print out a picture of Lincoln and Douglas and tape them to a Popsicle stick or pencil. Give half the kids Lincoln and half the kids Douglas. You are the moderator. Present the issues of the day: slavery, popular sovereignty, adding new states to the union, etc. When a student answers, he or she must do so from the perspective of Lincoln or Douglas (whoever’s head they were randomly assigned). This is a great Civil War Activity! The kids love it, and its a great change up from just a normal day of lecture and worksheets. This is a 50 question multiple choice Civil War test, with open response, document based questions and answer keys! Click here to get full access to our member area and download the Civil War test!